The Wedge Wire SB Profile range is our most frequently used wedge wire profile type offering minimum resistance to passing liquids and fine particles to alleviate potential blinding. Wedge Wire SB Profile – Boasting the largest ranges of Wedge Wire SB Profile within the UK, our extensive table of wedge wire profiles is available in a range of approximately ten Stainless Steel grades, with the most commonly used being 304 Wedge Wire SB Profile and the 316 Wedge Wire SB Profile. 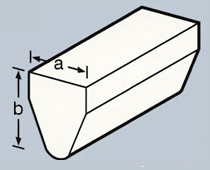 The data table provide theoretical values for the Wedge Wire SB Profile only, as support rod type and pitch may vary in selected applications. These welded wedge wire sb profile can also be manufactured with an inclined screening surface where required. Dedicated support rod profiles can be welded at intervals ranging from 6mm up to 100mm, depending on wedge wire sb profile and Slot Gap requirements. 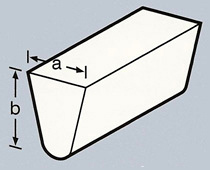 Wedge Wire Profiles and Technical Data for the Wedge Wire SB Profile, Wedge Wire SBB HS Profile, Wedge Wire GB Profile and Wedge Wire FB Profile. Similar to our SB Wedge Wire profile range, SBB and HS Wedge Wire profiles provide a larger body which is slightly parallel at the shoulder to restrict wear of the manufactured Slot Gap. Our range of GB Wedge Wire profiles offer an even taper similar to the Sb wires. This spectrum of wires have their own corresponding support rod profiles, including the facility of welding flat bars and round rods directly into the wedge wire profiles. Standard Looped profiles, from our FB Wedge Wire profile range, cater for most duties where a Looped Wedge Wire screen may prove beneficial in vibrating applications or traditional installations. Wedge Wire products / industrial Sieves & screens / Gaparator waste water screening machines and grilles / architectural mesh and products. Gap Technology Limited (Head Office & Works). Ava House, 1 Hill Court, Aurillac Way, Retford, Nottinghamshire, DN22 7PX.